The American Cancer Society estimates approximately 17,000 adults will be diagnosed with esophageal cancer this year in the U.S., and almost 16,000 deaths from this disease. Over the past 2 decades, the incidence rate of esophageal cancer has risen faster than any other type of cancer. Because symptoms do not typically develop until cancer is at an advanced stage, early detection must rely on identifying those at risk for the disease. For adenocarcinoma, a Swedish study has shown that the odds ratio for developing cancer in the setting of recurrent heartburn or reflux symptoms was 7.7, increasing to 43.5 for those with severe and long-standing symptoms. Admittedly, relying on GERD symptoms to identify those at risk is imperfect, since many diagnosed with esophageal adenocarcinoma do not recall any GERD symptoms. But for now, alternatives are limited. Approximately 20% of the U.S. population experiences GERD symptoms at least once a week, but many are unaware of the link between GERD and esophageal cancer. They live with this condition untreated or undertreated and do not discuss it with their medical providers. The Esophageal Cancer Action Network (ECAN) was established in 2009 to save lives by increasing awareness about the link between heartburn and cancer, promoting early detection, supporting medical innovation to prevent, detect, treat and cure esophageal cancer and link patients and families to compassionate support. ECAN is focused on the need for increased research funding and attention for Esophageal Cancer and is active in efforts to support federal funding of cancer research in the United States. In pursuit of that goal, ECAN successfully advocated with the National Cancer Institute to change course and include Esophageal Cancer in its genome mapping project known as the The Cancer Genome Atlas (TCGA). With input from physicians around the U.S, ECAN created a Guide for Patients, providing clear information about the link between heartburn and cancer. The Guide is designed to provide information so that patients can advocate for their own health care. It is available as a free download from the ECAN website (ECAN.org) in both English and Spanish and we plan to offer it in French in the near future as well. ECAN led the effort to have April designated as Esophageal Cancer Awareness Month in states throughout the U.S. With ECAN’s support over the past 5 years, more than 150 gubernatorial declarations of Esophageal Cancer Awareness Month have been achieved throughout the country and in some other nations, as well. Companies and organizations throughout the United States have followed ECAN’s lead and many activities and news reports are generated in observance of Esophageal Cancer Awareness Month in April each year. ECAN provides support for outreach during EC Awareness Month by sending free kits containing posters, brochures and periwinkle blue wristbands to anyone who orders them on our website at action.ecan.org/reachout. We will send these Reach Out kits anywhere in the world, but only have funding to provide free shipping within the United States. In addition to providing materials, since its inception, ECAN has sponsored or supported nearly 100 awareness events across the U.S. during the month of April and throughout the year. 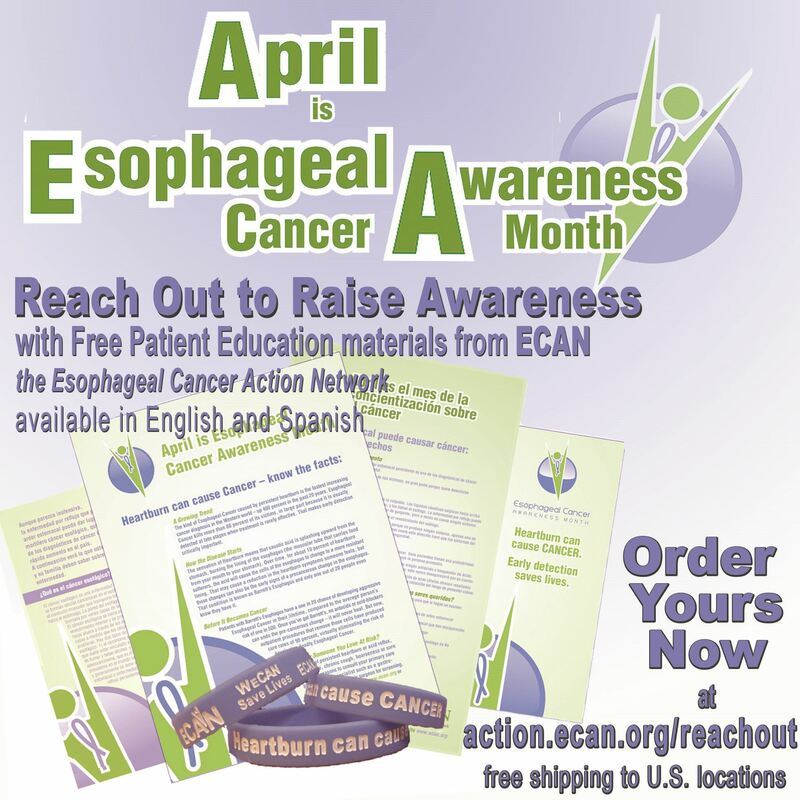 In addition to ordering our Reach Out Kits and sharing the materials provided, we ask that you join us in observing Esophageal Cancer Awareness Month by supporting ECAN’s activities, performing appropriate screening for those at risk, and continuing your research activities in the areas of prevention, early detection, and treatment of this deadly disease.